At last, Christmas is here. A PC gamer have a lot of options in these festive days especially graphics cards segment. For you, we have selected five graphics cards based on various factors. Main factor perhaps you know, is overclocking. Most of the graphic cards available now can be overclocked up to an extent. Advanced graphic card will come from factory in a pre-overclocked state in order to take advantage of upgraded hardware capabilities. Selection of a right cooler is the next important matter. It will allows to run underlying components without overheating and provides good frame rates. It also helps to control noise from the fans. Just go through the 5 graphics cards listed below. I’m sure you may get stuck at any one of those. 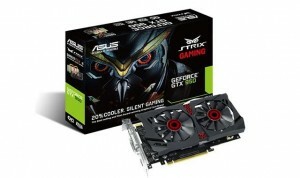 Although the labelled price of Asus GeForce GTX 980Ti Strix Gaming is £639.99, it is worth to buy if you can afford it. It is having a 1317MHz GPU overclocked in the factory itself. Its Strix GPU- Fortifier helps to reduce physical stress around your GPU. It uses PCI Express 3.0 interface with support for OpenGL 4.5. It is actually based on NVIDIA Maxwell architecture which is characterized by lower power draw and increased performance. From the factory itself, it has overclocked to a medium level IE, 1051MHz. It offers a reassuring five-year warranty. It has a 6 GB 384 bit GDDR5 memory also. Its price is £533. It is a graphics card which works in gaming mode by default. Support of 4x display monitors is a key feature of this card. The maximum resolution supported by this card is 4096×2160. It is having a video memory of 4GB DDR5. It’s marked price is £405. Have you heard about XFX Double Dissipation Cooling Design? It is what this product has to give. Its price is comparatively less as compared to expensive GPUs, only £309.99. Because of the same reason, it is noisier and slower. Anyhow, it offers 8GB DDR5 Memory. Finally, there is an economy product, MSI Radeon R7 260X OC. With its AMD Radeon R7 260X chipset and 128-bit memory interface, it offers solid gaming experience for just £90. Its memory is 2GB GDD5 and it can handle games up to 1920×1200 resolution.